Flushing Queens / February 1, 2010. This is the year of the Tiger. 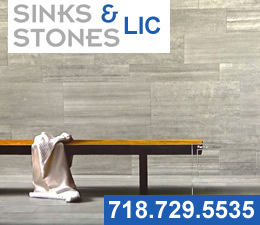 And on Saturday, February 20th, the Chinese Businessmen's Association will host the famous and fabulous Chinese New Year Parade 2010 in the Flushing neighborhood of Queens. 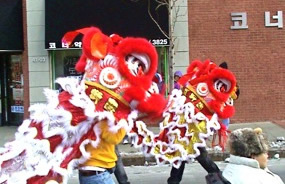 The Chinese New Year Parade in Queens celebrates the year of the tiger. 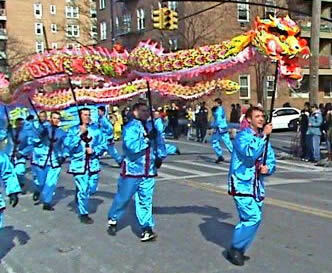 The Chinese New Year Parade begins at 11 am on Saturday in Flushing. This year  the Chinese New Year Parade will start at 37th Avenue and Union Street. The parade will snake south on Union, turns west on Sanford Avenue and then head south again along Main Street - all in Flushing neighborhood of Queens. This is purely based on conjecture, but based on what I saw last year, I have to believe that this is one of the best Chinese New Year Parades outside of China. 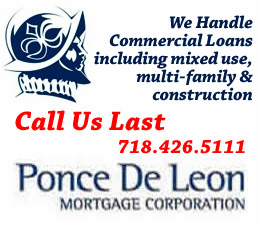 It's also one of the three best parades in Queens that I've witnessed [Columbus Day in Astoria in October and St Patricks Day in Sunnyside / Woodside - coming Sunday March 7th - see Members Calendar for details]. I recommend viewing this parade at least once in your life as the Asian pageantry is unparalleled. The Chinese New Year Parade in Flushing will be followed by a fireworks display in the street adjacent to Queens Crossing [about 12.30 or 1 pm]. Following the fireworks display, there will be a number of Asian cultural performances on the second floor of the Queens Crossing Mall. About 2,000 people are expected to participate and many more to attend. We will post more about this upcoming event, including photos from last year, on Monday. 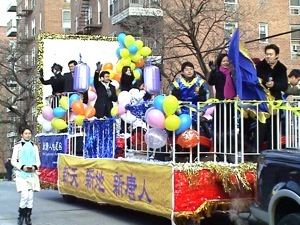 Click here for the Chinese New Year Parade in Flushing Queens NYC 2009. Flushing / January 31, 2009. 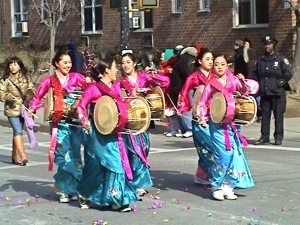 We had the opportunity to photograph the pageantry of the Flushing Chinese / Korean New Years Parade in Flushing. This year marks the year of the Ox, about which we will tell you more later in this story. 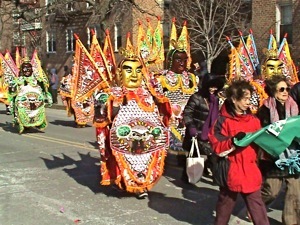 The Chinese American and Korean American groups collaborated in putting together this rich, colorful and ancient parade. 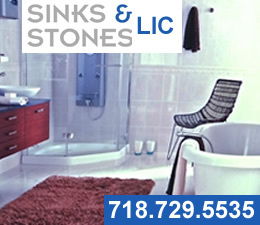 We snapped up many photos and have put together a photo gallery for you to peruse. Click here to read the rest of the story about the Chinese New Year in Flushing and to view the photo gallery of the parade. The Chinese in Queens celebrated the new year with a huge parade on Saturday in Flushing. This is the year of the Ox, the second year in the 12 year cycle of the calendar. The parade was a beautiful pageant of many cultural icons, including many peopled dragons, American-style floats, numerous bands playing music and of course ... the ox. There are 12 animals in all that make up the Chinese calendrical cycle and zodiac: the rat , the ox , the tiger , the rabbit , the dragon , the snake , the horse , the sheep , the monkey , the rooster, the dog and the pig and they go in that order, repeating continuously.